Juvenile Rockfish Survey (JRS) 2016- collected data from April 27, 2016 to June 12, 2016 sampling 4,983 nmi of ocean habitat. JRS samples hydrographic conditions, zooplankton (including krill) and young of the year (YOY) rockfish (Sebastes spp.) and other micronekton using CTD casts, Tucker trawls, and mid-water trawls (MWT), respectively, at a series of stations along the continental shelf from southern to northern California (raw data courtesy of SWFSC: Sakuma et al. 2006, Field et al. 2010, Santora et al. 2012). Juvenile Salmon Survey 2016- collected data from June 17, 2016 to July 03, 2016 Sampling 1,906 nmi of ocean habitat. 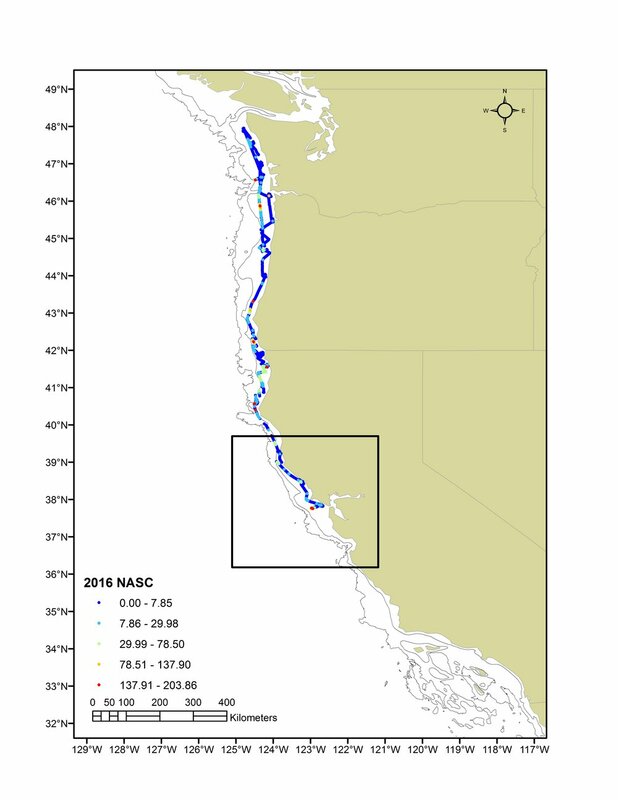 Juvenile salmon survey samples hydrographic conditions using CTD casts, zooplankton (including krill)(vertical nets and bongo nets) and surface trawls to study young of the year (YOY) salmon from Pigeon Point, California to Heceta Head, Oregon (raw data courtesy of SWFSC: Hassrick et al. 2016 ).